I imagine some of you are wondering about the new art style and concept of Sneaksneak we revealed a while back. I’d like to take the time to tell you about a part of it, namely the environmental elements visible in the header image. Obviously these elements differ wildly from any bit of environment we ever had in Sneaksneak’s older incarnation. Back when Sneaksneak was little more than a glorified student project, the focus within the project was always on having a solid game design. After all, this was what we were graduating on. For us that left very little time to think about a fitting setting, story or art style. The little bit of story and setting we did manage to cook up was the result of a single brainstorm session which was held with the sole purpose of facilitating our artists with at least some grounds to work from. What sprung from that was the highly colorful and flashy Sneaksneak seen below. When I decided to take Sneaksneak beyond a student project I sat down with Meindert of MeinMein Studios to discuss the possibilities of partnering up. A couple lot of beers later and we were quite in sync concerning our wishes for the game, including the direction we wanted to take the story and setting into. Our mutual interest in topics like hard sci-fi and Meindert’s love for clean, straight geometric shapes left us with a clear starting point. 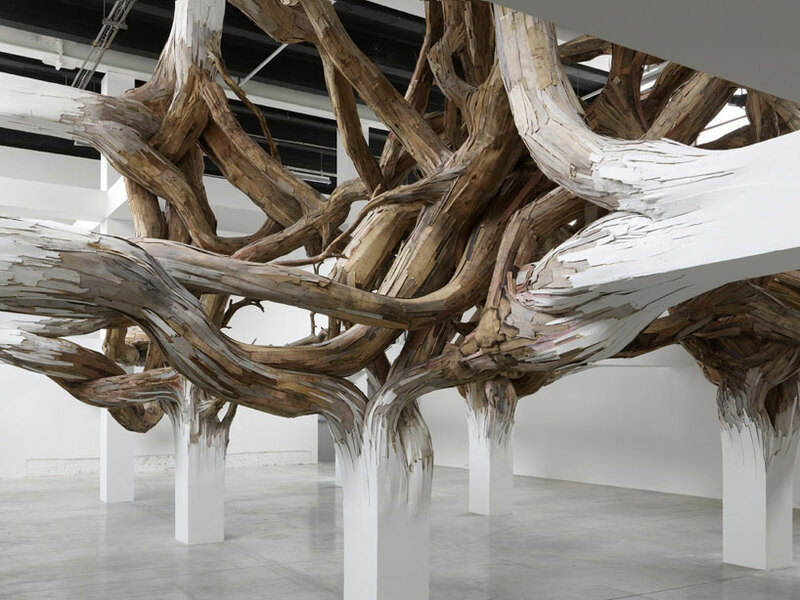 In the weeks to come, while working out the environment’s role in the story (of which we won’t tell you anything about just yet :), we got heavily inspired by the works of Henrique Oliveira, in particular the contrast between clean geometric shapes and dynamic nature-like swirls used in some of his works. Henrique’s work proved to be essential in further developing the environments and best of all, it fit neatly within our concept for it. Another integral part of nailing down the environments were truncated octahedrons. 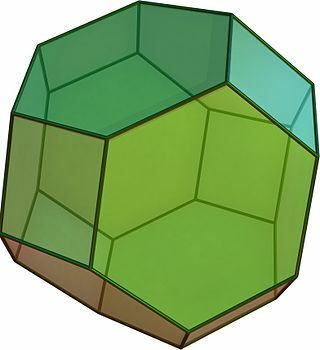 Meindert mentioned these shapes as being one of the few shapes in mathematics to be completely space-filling and pointed me towards this research paper in which this very shape is praised as “the most promising polyhedron-based spacecraft geometry for future application to space exploration”. So we toyed around with the idea of having the clean geometric elements of our environments be constructed of these modular shapes and somehow we never managed to let that idea go. This was mainly because, like Henrique’s work, this too fit so amazingly well with the in-game story behind the environments (I’m sure all this would make much more sense if I would tell you more about the story!). Another important aspect of the environment is a very lively, dynamic and colorful type of nature. This nature has red fiber-like bundles as a core element and contains a wide variety of alien plant life and fungi to support it. In the header image the bundles are visible beneath and inside the modular construction. The nature aspect of our environment contrasts heavily with the modular aspect of it, somewhat similar to Oliveira’s works, except that nature and geometry have switched places. Our concepts for these environments were visualized and co-developed by our artist at that time, Daniel Joustra. Unfortunately Daniel left us for big oll’ Canada shortly after we solidified the design of the white modular constructions, leaving the designs of the nature aspect of the environments in it’s early stages. Having said that, we’re about to start working with an artist that knocks alien landscapes out of the park and then some! We’re really excited about this and we’ll tell you all about it soon enough. Yesterday the folks over at Xbox announced the first wave of game developers making use of their [email protected] program. And wouldn’t you know it, Frambosa and MeinMein were on it! With that in the open, we’d like to make our first (but not only) announcement concerning a release platform. Sneaksneak will be coming to Xbox One! Our experience so far with [email protected] has been very positive and we’re confident that by being part of it we will see Sneaksneak get released on their console when the time comes. Welcome to the new website of your favorite co-op stealth platformer, Sneaksneak! As the observant among you may have noticed, the site isn’t done yet. Due to a possible soon to be made announcement we felt the time was right to start this baby up again and feed you guys bits of information on a more regular basis. The more loyal followers have undoubtedly noticed a massive change in the game’s art style when looking at the header image. Sneaksneak has been (and still is) undergoing some major improvements these last couple of months. It will still be the same game you played at events at heart, but bigger and better. This is to say the game is still all about teamwork, stealth, perfect timing and yelling at each other at high volumes. One exciting change Sneaksneak underwent was within the team. Having partnered up with MeinMein, Sneaksneak is no longer being developed by Frambosa alone. With these guys on board we dare dream bigger for Sneaksneak. The changes that come with bigger dreams are what we are currently working on. Unfortunately it requires the game to be build from scratch (again) and on the art side of things we’ve also had to start over and grow in a new direction, requiring new artists join our endeavor. Like I said, we’ll be updating on a more regular basis so don’t go too far!